The Battle of Khe Sanh was conducted in northwestern Quang Tri Province, Republic of Vietnam (South Vietnam), between 21 January and 8 April 1968 during the Vietnam War. The combatants were elements of the United States (U.S.) III Marine Amphibious Force (III MAF), elements of the South Vietnamese Army of the Republic of Vietnam (ARVN) and two to three division-size elements of the People's Army of Vietnam (PAVN). The American command in South Vietnam gave the defense of the base the nickname Operation Scotland. The American command in Saigon initially believed that combat operations around Khe Sanh during the summer of 1967 were just part of a series of minor North Vietnamese offensives in the border regions. That appraisal was altered when it was discovered that PAVN was moving major forces into the area during the fall and winter. 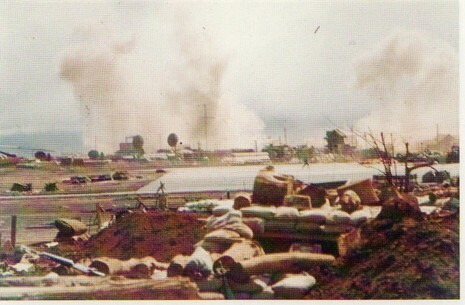 A build-up of Marine forces took place and actions around Khe Sanh commenced when the Marine base was isolated. 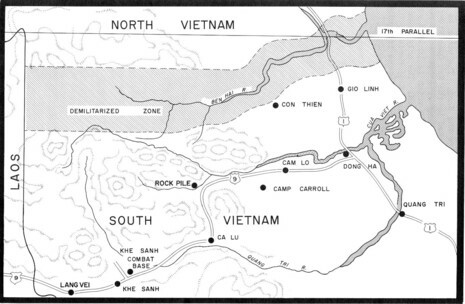 During a series of desperate actions that lasted 77 days, Khe Sanh Combat Base (KSCB) and the hilltop outposts around it were under constant North Vietnamese ground, artillery, mortar, and rocket attacks. During the battle a massive aerial bombardment campaign (Operation Niagara) was launched by the U.S. Air Force to support the Marine base. This campaign used the latest technological advances in order to locate PAVN forces for targeting. The logistical effort to support KSCB, once it was isolated overland, demanded the implementation of other tactical innovations in order to keep the Marines supplied. In March 1968, an overland relief expedition (Operation Pegasus) was launched by a combined Marine/Army/South Vietnamese task force that eventually broke through to the Marines at Khe Sanh. The battle itself was a tactical victory for the Marines, but the battle had no clear strategic implications. Was it a diversion or a serious attempt to seize the combat base? General Westmoreland was convinced it was no diversion. On the contrary, given the existence of the large build‑up of PAVN forces in the vicinity of Khe Sanh and the DMZ, Westmoreland felt it would be much more logical for the Communists to stage diversionary attacks elsewhere in Vietnam "while concentrating on creating something like Dien Bien Phu at Khe Sanh and seizing the two northern provinces [of South Vietnam]. "18 Westmoreland's intelligence officer, General Philip Davidson, calls the notion that Giap viewed Khe Sanh as a strategic diversion to cover his attacks against the cities of South Vietnam during Tet a "myth... with no factual basis."